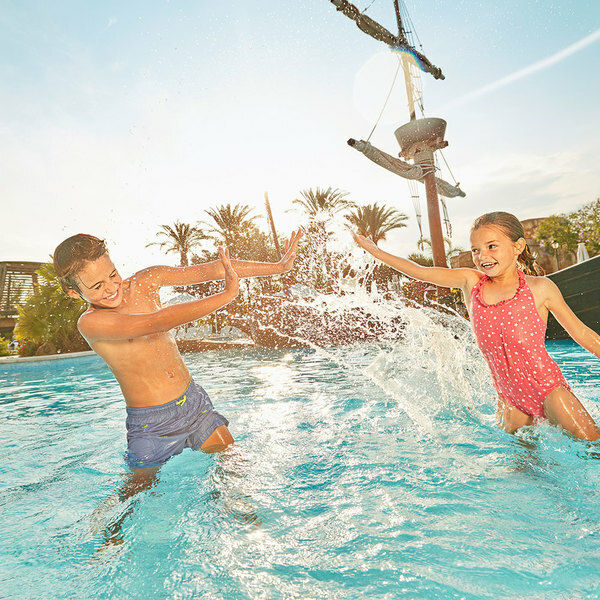 Feel just like you’re in the Caribbean at PortAventura Park. PortAventura World is set in the heart of the Costa Dorada, very near to Barcelona. Enjoy the beaches, cuisine and culture of the area in the unique setting of PortAventura World. Take the A-7, direction Tarragona. Take exit 35, direct to PortAventura. Take the A-7, direction Valencia. In both directions, PortAventura has direct access from the AP-7, a motorway that connects several national roads. The GPS coordinates to get here are: Latitude: 41º05'30.50"N Longitude: 01º09'14.75"E / Decimal: 41.091806; 1.154097. Look up the route here indicating your place of origin. The resort has its own stop on the R-16 line run by the company Renfe, linking PortAventura with all towns on the Mediterranean coast. Check the route here. The Port Aventura train station is not inside the theme park itself, but is instead located next to the Hotel Caribe and the Hotel El Paso at PortAventura World Once at the station, follow the directions to your hotel. If you are staying at Hotel Gold River, Hotel Colorado Creek, Hotel PortAventura, or Hotel Mansión de Lucy, you can call the local taxi service to request a transfer from the Renfe station to the Hotel reception (Taxi Salou telephone number 00 34 977 38 50 50). Renfe runs high-speed and AVE trains connecting the entire peninsula with Camp de Tarragona station. Bus: From the Camp de Tarragona AVE station, the public transport company Plana runs buses on line L4, which stop at the resort. Check here for service information. Taxi: In all train stations taxis are available to take you to the resort. Car: If you are hiring a car, we advise that you manage the booking arrangements before your arrival for the best service and guaranteed availability. There are a number of local companies to choose from, and PortAventura’s official car hire partner GoldCar operates from offices within the area. Benefit from a special 20% discount on your car rental! We advise you to arrange your reservation in advance. The GPS coordinates to get here are: Latitude: 41º05'30.50"N Longitude: 01º09'14.75"E / Decimal: 41.091806; 1.154097. Look up the route here indicating your place of origin. 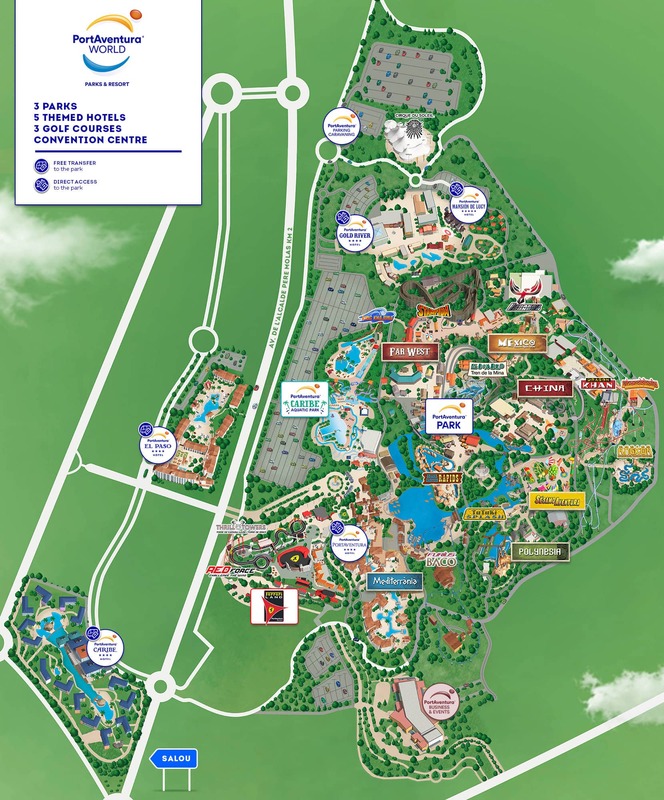 Transfers: PortAventura provides an additional transfer service from the Camp de Tarragona AVE station to the PortAventura hotels. Book it here. Bus: A few metres from the main exit of Terminal 1, the public transport company Plana runs direct buses to Port Aventura. Check here for times. Taxi: At the exit of Terminal 1 taxis are available to take you to the resort. Car: If you are hiring a car, we advise that you manage the booking arrangements before your arrival for the best service and guaranteed availability. There are a number of local companies to choose from, and PortAventura’s official car hire partner GoldCar operates from offices within the area. Benefit from a special 20% discount on your car rental! We advise you to contact your chosen company before arrival in order to manage your booking in advance. Click here to find the best deals. The GPS coordinates to get here are: Latitude: 41º05'30.50"N Longitude: 01º09'14.75"E / Decimal: 41.091806; 1.154097. Look up the route here indicating your place of origin. Train: From Barcelona Airport Terminal 2 there is a free shuttle bus service to take you to the train station. From the station: Take line R2-Nord direction Maçanet-Massanes and change at Estació de Sants (Barcelona city) to take line R-16 (direction Tortosa/Ulldecona). This service stops at the resort. Check here for times. Transfers: PortAventura provides an additional transfer service from El Prat Airport (Barcelona) to the resort hotels. Book it here. Bus: A few metres from the main exit of Reus Airport, the public transport company Plana runs direct buses to Port Aventura. Check here for times. Taxi: At the airport exit taxis are available to take you to the resort. Car: If you are hiring a car, we advise that you manage the booking arrangements before your arrival for the best service and guaranteed availability. There are a number of local companies to choose from, and PortAventura’s official car hire partner GoldCar operates from offices within the area. Benefit from a special 20% discount on your car rental! We advise you to contact your chosen company before arrival in order to manage your booking in advance.The GPS coordinates to get here are: Latitude: 41º05'30.50"N Longitude: 01º09'14.75"E / Decimal: 41.091806; 1.154097. Look up the route here indicating your place of origin. 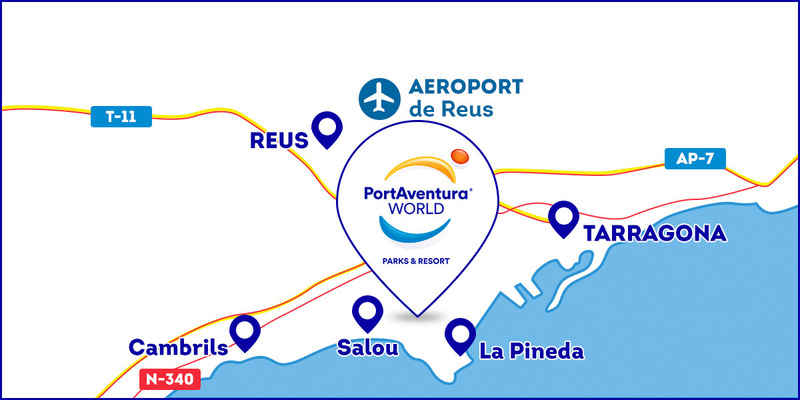 Transfers: PortAventura provides an additional transfer service from Reus Airport (Tarragona) to the resort hotels. Book it here. The Plana bus company offers several daily bus departures operating between Barcelona and PortAventura World. You can catch a bus from the main points of the city: Avenida Diagonal and Paseo de Gracia. Check here for departure times. The Plana bus company offers several daily bus departures operating between local towns and PortAventura World. Routes are between the towns of Cambrils, Salou, Vila-seca, La Pineda, Reus and Tarragona. Check here for times. Take the A-2, direction Zaragoza, and join the AP-2. Take exit 9, direction Tarragona. Take the C-14, direction Reus, and follow the A-7 until exit 1152 direction Salou. PortAventura World can also be directly accessed from the AP-7, a motorway that connects with several national roads. RENFE offers travellers high-speed and AVE trains with departures from Atocha station arriving directly at Camp de Tarragona station. Bus: From the Camp de Tarragona AVE station, the transport company Plana runs buses on line L4, which stop at the resort. See here for information on this service. Taxi: In all train stations taxis are available to take you to the resort. (telephone Salou Taxis: 977 38 50 50). Car: Major car rental companies have offices at the Camp de Tarragona AVE station, where you can hire a vehicle. We advise you to arrange your reservation in advance. The GPS coordinates to get here are: Latitude: 41º05'31.83"N Longitude: 01º09'24.16"E / Decimal: 41.092175; 1.156711. Look up the route here indicating your place of origin. There are direct connections between Madrid and El Prat Airport in Barcelona via regular and shuttle flights. Bus: A few metres from the main exit of Terminal 1, the transport company Plana runs direct buses to Port Aventura. Check times here. Car: Major car rental companies have offices at the airport, where you can hire a vehicle. We advise you to arrange your reservation in advance. The GPS coordinates to get here are: Latitude: 41º05'30.50"N Longitude: 01º09'14.75"E / Decimal: 41.091806; 1.154097. Look up the route here indicating your place of origin. From Barcelona Airport Terminal 2 there is a free shuttle bus service to take you to the train station. From the station: Take line R2-Nord direction Maçanet-Massanes and change at Estació de Sants (Barcelona city) to take line R-16 (direction Tortosa/Ulldecona). This service stops at the resort. Check times here. Buses depart from the Interchange on Avenida de América. Several bus companies operate on routes towards Salou, such as Alsa (with a journey time of approximately 7 hours) and PortAventura, all departing from the Interchange on Puerta América in Madrid. 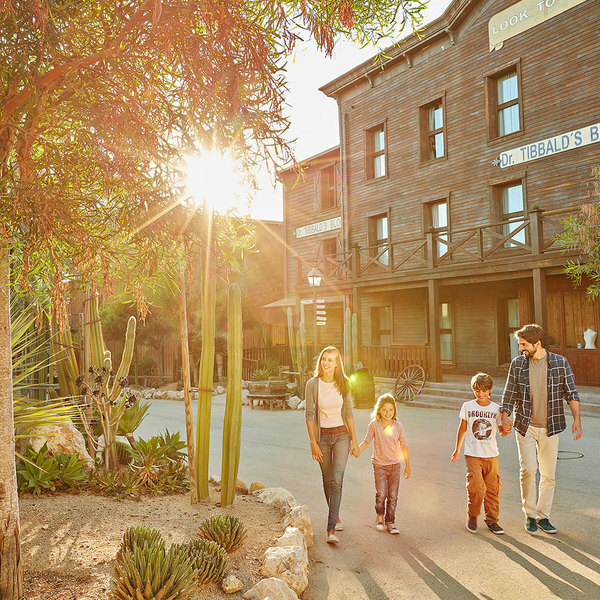 Experience the authentic Far West, with direct access to the park! Enjoy the convenience of this hotel, with direct access to the Mediterrània theme area.